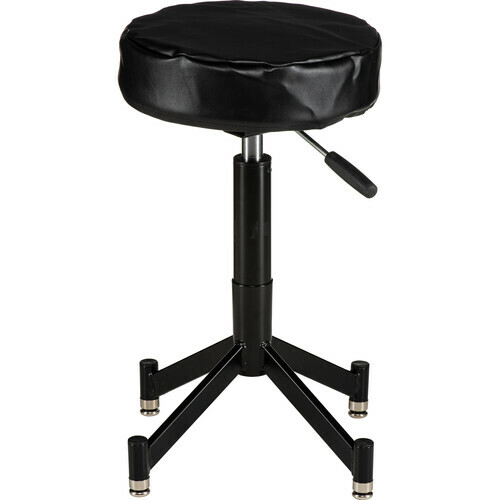 A 4 leg posing stool designed and manufactured with attention to quality-- seating that is durable, good looking, and functions properly for long lasting service. Simple pneumatic height adjustment is controlled by a single lever. Foam-filled vinyl cushion adds to your subject's comfort. Seat is quickly disassembled from legs. Legs fold compactly for ease of portability. Box Dimensions (LxWxH) 13.5 x 12.5 x 10.0"
Steel Posing Stool with 4 Leg Tubular Base, Cushion is rated 4.4 out of 5 by 8. Rated 4 out of 5 by Grend from Decent quality adjustable posing stool I needed a simple height adjustable posing stool, and this did the trick. It seems to be well made and fairly hefty for its compact size. I've already used it on several commercial shoots, and it performed like a champ, both for the model, and occasionally for photographer use as well. The only minor quibbles would be (as a previous reviewer noted), the press-fit center post which I would have prefered a locking/disconnect mechanism for transport. Also, this is a minor aesthetic point, but the cushion looks a bit lived in meaning it came out of the box with waves in the material's surface, which detracts just a bit from its overall appearance. Rated 4 out of 5 by Anonymous from excellent product for studio or location I've owned one of these for 10+ years and it's great. Height adjustment is simple, being able to remove the legs makes packing a tight car trunk easier and the cushion is a MUST-HAVE accessory. Rated 3 out of 5 by Anonymous from Good value These stools represent a good value. Somewhat disappointing however. The upright for the seat itself (i.e. the shock absorber) just slips into the 4-legged base. Although they have been sat on a few times since my purchase, on two occasions I have picked the stool up by the seat itself and have had the 4-legged base fall off onto the floor. The shock absorber, despite having been sat on, doesn't seem to stay locked into the base. There is no locking mechanism for the shock as the stools are meant to be easily disassembled. The base is somewhat heavy and would probably hurt if it fell on your foot. Luckily the base did not land on my foot when it fell off. Having said that the quality of the components are good. The shock and its adjustability work excellent. Perhaps over time the shock will wedge itself into position and not come out of the base so easily. The workaround for this is to hold the seat with one hand and hold the 4-legged bottom of the stool with the other. Overall I feel the stool offers good value for the money spent. This is my first studio and cannot comment on other branded stools as I don't own any other brands. If I were to buy more stools I would be willing to purchase this unit again. Rated 5 out of 5 by Wade from Solid, professional stool I bought this posing stool to use for portrait sessions at remote locations, and it works marvelously. It's very solid and comfortable, and easy to adjust. I just shot 50 back-to-back portraits for a High School drama group in one day, and it worked flawlessly with every adjustment. Everyone was happy with it.The only minor flaw is that once assembled it's hard to take back apart for transport and storage, because as mentioned in other reviews the pneumatic cylinder middle piece press-fits into both the seat bracket and base and those connections get tight with use. I's fairly compact when collapsed, though, so I chose to transport and store it in one piece rather than risk breaking it prying about the components.Very solid and professional duty piece of equipment that I expect to last for a long time. Highly recommended. Rated 4 out of 5 by JJANKO from Excellent posing stool. Excellent price. I use the posing stool in my photography classroom when I teach students the proper way when posing for portraits. It goes up and down easily and is very sturdy and well made. I wish the cushion had a bit more cushion. Sometimes I use the stool for myself when I'm shooting in the studio for long periods of time and it becomes a little uncomfortable. Rated 5 out of 5 by Digital Don from A Posing Stool Worth its Weight When taking executive portraits, the chairs in their office aren't always appropriate for portraiture. This product is perfect for such shoots. The size is great and the ability to disassemble for transport is a time saver. It's sturdy and adjusting the height is easy and the comfortable seat gets high marks from clients. Rated 5 out of 5 by Donald from SIMPLE AND VERSATILE I do a lot of quick head and shoulder photo shoots for actors and also in schools. The stool is robust and easy to adjust the height. Well worth the money. Rated 5 out of 5 by Aspiring Filmmaker from Haven't used yet Haven't used it yet but I'm sure it will work very well! is there a spot under the seat that i can connect an arm rest? Is there a documented maximum weight for the subject? Anyone have any problems with the seat sliding down when someone is sitting on it? I have used these stools in the school day photo environment for years. I have never had a problem with sliding from a persons weight. Believe me we have seen it all. You should not have any issues.